The answer to that second question is yes, and I’ll explain how in a moment. To answer the first question, you need to go back to 2011 and the release of Mac OS X 10.7 Lion, and then follow along with our coverage. With Lion, Apple introduced the Modern Document Model, which changed how documents are saved and handled — that’s where Auto Save, Resume, and Versions came from. Applications that supported the Modern Document Model also replaced the File > Save As command with File > Duplicate (see “Subtle Irritations in Lion,” 17 August 2011). That wasn’t popular with users (see “The Problem with Lion’s Duplicate Command,” 27 October 2011), so in 10.8 Mountain Lion, Apple brought Save As back, albeit hidden behind the Option key and with a nasty side effect: when you made changes in a document and then used Save As, your changes were also saved to the original document (see “The Very Model of a Modern Mountain Lion Document,” 7 August 2012). Finally, in 10.8.2, Apple made it possible to control whether changes to the original document would be saved or not, via a checkbox added to the Save dialog (see “With 10.8.2, Mountain Lion Saves Even Better,” 20 September 2012). As far as I’m aware, nothing related to Save As has changed since Mountain Lion, so the reason you still see Duplicate instead of Save As is that the application in question supports the Modern Document Model. New apps almost always will, but apps with older code bases, like BBEdit and Microsoft Word 2008, still use Save As instead of Duplicate. Regardless, the more important question is how you can bring Save As back, if that’s what you’d prefer. I fall into that category — the make-a-duplicate-and-then-save model doesn’t fit with the way I think or work. You could remember to press Option when the File menu is showing to reveal Save As or invoke Save As from the keyboard with Command-Shift-Option-S. But that’s fussy, and there’s a way to put Save As back on the File menu permanently, and even replace Duplicate with it, if that’s what you want. Open the Keyboard pane of System Preferences, click Shortcuts, and at the bottom of the list on the left, select App Shortcuts. Click the plus button underneath the right-hand pane. a. Leave the Applications menu set to All Applications. b. In Menu Title, type “Save As…” (without the quotes, and with three periods). c. Click the Keyboard Shortcut field and press Command-Shift-S.
To verify that your change has taken place, click the File menu in TextEdit, which supports the Modern Document Model. You’ll see that Save As shows now, with the keyboard shortcut of Command-Shift-S, and Duplicate is also there, with no shortcut listed. The reason this technique works is that Save As is an “alternate” of Duplicate; that is, the two commands normally have the same keyboard shortcut apart from the Option key. By assigning Command-Shift-S to Save As, you’re taking it away from Duplicate, thus breaking the relationship between the two commands. Let’s take this one step further. If you never use Duplicate and are bothered by its presence, you can make it the alternate of Save As, thus ensuring that it will show in the File menu only when the Option key is pressed. 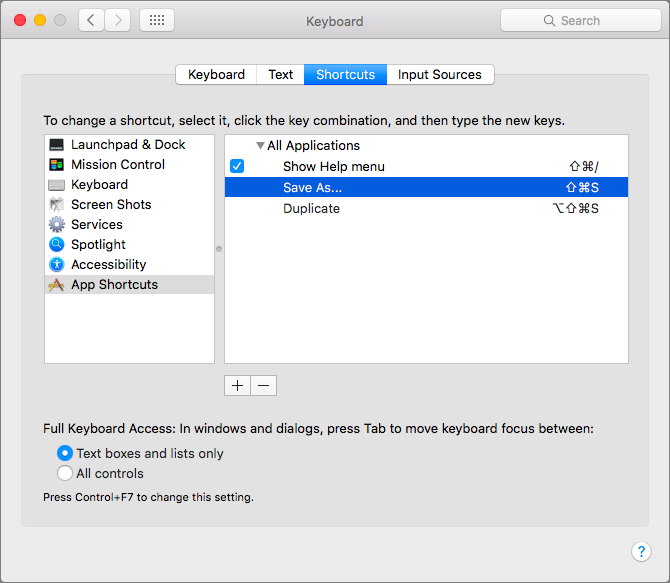 Just follow the same steps above, entering “Duplicate” into Menu Title, and setting the keyboard shortcut to Command-Shift-Option-S. You’ll end up with a pair of shortcuts that swap the two commands in the File menu. When you next look at the File menu in TextEdit, you’ll see only Save As, and when you press the Option key, Duplicate will show instead. There’s only one problem, which is that this keyboard shortcut takes over for the Finder’s Duplicate menu item too, which is normally Command-D. The fix is to create another shortcut, for just the Finder, which assigns Command-D to Duplicate. Needless to say, should you wish to revert to OS X’s default behavior, with Duplicate on the File menu and Save As appearing only when you press Option, select those items in Keyboard > Shortcuts and click the minus button to delete them. One final comment: Remember how I said that OS X 10.8.2 added a checkbox to the Save dialog when using Save As on a document that had unsaved changes? That “Keep changes in original document” checkbox is important, because if you’re looking for the traditional behavior of Save As (where the original document remains unchanged), you should make sure to deselect that checkbox. When it’s selected, Save As works like Duplicate, and both the original document and the new document end up with the same changes. Although that checkbox is selected by default, OS X does remember its state, so after you deselect it once, it will remain that way. I hope you found this Mac basics blast from the past helpful, and if you’d like to see more of this sort of content, let us know in the comments. Adam, YES to more of this stuff. I suspect that some will be familiar but if SOME is an big slap of the head, as this was, I will be very grateful. This is great. Been bugging me for years . Please if you have any more like this keep sharing! That's great Adam. Seem to remember this from the past but never set it up. Much more comfortable with Save As. Did keep Duplicate and assigned it cmd-shift-D which doesn't seem to conflict with anything (so far). Yes please, more of the same kind of tips would be welcome. Command-Shift-D is normally the keyboard shortcut for Go > Desktop in the Finder - it changes the view of the current Finder window to the Desktop folder. So there's no harm in using it; just be aware that that's what it was before. OK. Thanks. Didn't know. Don't usually use the Go menu. Would usually go to desktop via the sidebar items in an open Finder window. So not an issue for me but good to know. I'd missed this before. TextMate has Save As, but handy to have and I hadn't even known about the alternative with the Option key (Apple shouldn't hide so many things behind Option keys or roll overs, but that's another story). Can AutoSave be turned off? Or is there a one-step way to close without changing? I see the Revert, but by instinct I close assuming changes aren't saved, which is true with some apps still (fortunately). TextMate works the "old" way; asks if you want to save changes when closing. The Mac is now stable enough that AutoSave is less necessary. And some apps (I think) remember where you were after a crash (at least I think some do). I understand why things are the way they are because most people would assume their changes are saved, but some of us old timers are still around. Yes, indeed. In the General pane of System Preferences, there's a checkbox for "Ask to keep changes when closing documents." If that's selected, OS X will turn off Auto Save and ask you about saving unsaved changes whenever you close a document. If that checkbox is deselected, Auto Save will be in effect, and any unsaved changes will be saved automatically for you, so you won't be prompted. Again, this is a Modern Document Model feature, so not all apps will follow this setting (although those that don't will probably have their own autosave functionality built in). And THIS my friends is why I am a lifetime TidBits member. THANK YOU. Now where did that Paste Match Formatting hint run off to?? However, Word does not obey this so it has to be set under the Tools Menu -> Customize Keyboard. The Category is Edit and the Command PasteDestinationFormatting. I was hoping this would perform the same result as PasteSpecial:Unformatted Text, but it doesn't. At the moment, I can only add a toolbar button for PasteSpecial, which brings up the dialog box to click on Unformatted Text (it's not even the default choice, oddly). Is there any way to reduce that to a single command that can be assigned to a button? I can't seem to create a macro for it. BBEdit isn't older. It uses the old document model, I presume, because programmers need control over the timing of their saves: especially if they're modifying files in live systems. We could ask Rich, but I suspect the fact is that BBEdit uses the old document model because that's how it worked for many years before Apple changed things, and there was no advantage (and potential problems) with the Modern Document Model for many of BBEdit's uses. It's also possible, though I don't know, that as a Carbon application (as opposed to Cocoa), like Word, that the Modern Document Model stuff isn't available. Of course, this kind of articles is of utmost interest! Thanks to you. I always duplicate a file in finder first. This seems to me to be the safest approach. That's a good general principle, but when you're doing a multi-step process, you may want to save each step as a different file. "Save As ..." is much more convenient than duplicating each time. Excellent. Keep these tips coming. Very helpful. Last month I finally replaced my 8-year-old iMac and went from Snow Leopard to El Capitan, and restoring the "Save As" was near the top of my list of things to tweak about the system. I think the last generation of pre-Lion users will be making the jump with me soon, so tips like this are helpful. This is literally the most useful thing anyone has posted on the internet this week. By a long shot. Fantastic tip for a very old Mac user. Might be enough to cause me to purchase the whole series of Take Control for the various OS X versions. Regarding your “One final comment”. 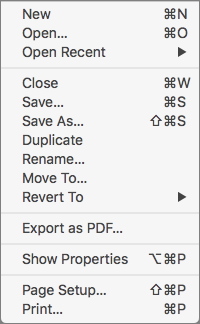 When using TextEdit Option Save As on a document with changes, the “Keep changes in the original document” dialog does not appear if you have created the shortcuts shown above. To get it back, I had to delete the shortcuts, restart, and it came back. What is even more strange is that dialog was not there in Mavericks originally. It is in Mountain Lion, Yosemite, and El Capitan. Don’t know if it is something you should do before creating the shortcuts or what the ramifications are if you do or do not. Yes, the option is there. But it only appears when you select "Save As..." on a document that's already saved. To make the option appear, create a new document. Save it somewhere. Now select "Save As...". The option will appear. Another yes, and more like this, please. Great stuff, tips like this are invaluable. Thank you! Thank you! And, YES, to more. Thanks for that. In some programs (like Safari), "Save As..." is there in all its glory under 'File' -what's that about? Apple is known for being consistent but this breaks it. Another thing; going from "Don't Save" to "Revert Changes" and "Don't Save" to "Delete" from a new document is a bit of a shock too! Safari is probably an exception to the Modern Document Model approach, since it's not really a document-based application at all. You might want to save a Web page, but the concept of duplicating a Web and then saving it is nonsensical. Yeah. I guess "Duplicating" a web page to be 'saved' would be even more confusing! How's that sound? Thank you, thank you, thank you! That's all I'm going to say! MULTIPLE thanks from me! I've been burned by my old Save As... habits (although usually rescued by Time Machine) more than once. Great tip, this has been bugging me for ages! The switch from Save As to Duplicate (or, more importantly, the advent of the "always live" document) was yet another example of Apple trying to make operation seem "intuitive" and yet it ends up doing things you don't want! What would make anyone think this is a good idea??? Yes, this is very useful. Perhaps a place to find a collection of these on Tidbits.com. Please keep on supplying us with this type of content. It makes it so much easier to convince myself to renew my TidBITS subscription. Thanks, Adam! Very useful! Your instructions worked flawlessly. Very nice. I was wondering though, instead of typing three periods, wouldn't it be better to do an ellipsis using "Option" and the colon/semi colon key? Or doesn't it matter? An ellipsis won't work. The stock menu items apparently use three periods. You have to match the name exactly. Thank you, Colleen, your advice worked for me running OS 10.11.2 Beta (15C48a). I can't quite remember the history of this, but at some point, Apple wised up and made the Shortcuts setup accept both three periods or an ellipsis (Option-semicolon). I opted for the simpler instructions, but either approach works fine. Yes, very helpful to folks who have been using Save As for decades! And thanks for the hint on turning off autosave. Now if only there were a way to bring back MacDraw. Nothing else touches it for ease, power, and simplicity. I even used it to create a scaleable font pre-TrueType. Hmmm, in Mac OS 10.8.5, if I select "Save As..." in TextEdit, I DON'T get the "Keep changes in the original document" checkbox. It appears only if there are unsaved changes in the document when you choose Save As. Great article! How can I print it? Thanks! And yes, more please. Great article Adam. And it solved a dilemma for me. BUT I didn't realise the consequences of the REVERT wording (I was used to the old "Save Changes?" when there was no revision backups being done automatically) and wrongly mistook the REVERT meaning was actually the opposite of discard changes. [Do something wrong the first time and that can become the belief!]. I found I had duplicated invoice numbers, but with different clients and couldn't work out why when I was so careful not to mess things up. Now I understand why! If you use Safari ... use Reader View (Shift + Cmd+ R or choose from the View Menu) and print from there or from within the Print Dialogue box choose Save As PDF and import PDF into Word (or better still use Pages instead of Word :-). Thank you. I guess I missed this the first time around. It may sound stupid, but one of the things I have been dreading about getting a new Mac (I really don't replace them often AT ALL) was not having the "Save As ..." function available. I do a lot of photo editing and need to save each major step (cropping, image size, image resolution) as I go along. Duplicate and rename (or whatever) was just not appealing at all. I, too, often save multiple versions of image files. Starting with Photoshop CS6, I believe it was, Photoshop also has an auto-save function, which can be useful when the app crashes—which it does less often these days on new hardware, reducing the need for frequent saves that used to be an essential part of any workflow. Older versions of Photoshop, including CS4 and 5, still run just fine on new Macs, though CS6 and the Creative Cloud versions are better optimized for the newest hardware. But with this tip you can insure that whatever app you use will include Save As..., even if it's made to Apple's new standards. Another advantage of Photoshop is that you can designate an alternate scratch disk so that it will not hog space on your boot drive for cache files. An external USB 3 hard drive would work well for this purpose. Of course, if you get a new 27" iMac, you will have a choice of internal drives; a 2GB Fusion Drive will offer some of the performance advantages of an SSD and ample storage capacity, for virtual memory and application cache files, that will also aid performance, without the expense of a large SSD. If you do opt for an internal SSD, however, the ability with Photoshop to use an external drive as a scratch disk would be quite valuable. Whichever new Mac you choose, you will notice a significant improvement in performance across the board for image processing, whatever program(s) you work with. Thanks. This one article convinced me to become a paying member. If feels like Apple has been torturing me with small cuts (like this) and large ones (like dropping Aperture) for years. It's nice to find a way to fight back in a small way. This was useful, and much appreciated. More like this, please. Thank you very much. This has been a thorn for many 'quite a while's'. Doesn't work for me running an El Capitan beta version 10.11.2 Beta (15C48a). Did you read/follow Colleen Thompson's reply to Jonathan Miller's post above. The ellipsis is sometimes automatically populated when typing three periods in a row. To get around that, I typed three periods with a space before and after the middle period and then went back and removed the spaces. Entering the three periods that way did the trick for me. Hope this helps. The ellipsis should work - it does for me. But perhaps if it's being replaced automatically by something, you're actually getting a slightly different Unicode character, or some invisible character is sneaking in too. Three periods will be replaced with ellipsis if you have those characters in the right (Replace/With) column of the Text panel of the Keyboard preferences. In order to prevent the replacement you will have to delete the item from the list. It would be a cool feature if there were a way to override it on a case by case basis. Unfortunately, like many Apple "features", it was left half baked, making it more of a nuisance than a service. Please more of this to help us function better. Thanks keep it up. Thank you. Has made document handling so much easier. El Capitan 10.11.1. More like this please. It didn't work for me (I just get an error beep when I try it. I sure wish it had worked. I am running OX 10.7.5. Yes, unfortunately, it won't work for you because the feature appeared in 10.8 Mountain Lion. Wow, this was great. I've been complaining about the missing "Save As" problem recently with a fellow longtime Mac user. I guess I like it because I fit your main reader profile so nicely: 62 year old Mac-user who gets TidBITS via email. Thanks! Thank you! I needed Save As. I have 2 other things which bother all of my us Mac users. First one, to see the size of photos on the desktop, you have to hit Command J over and over again, and then uncheck Show Item Info, then re-check it to show, this is very annoying to have to do this repeatedly when we are working with some photos with PS or other software. Second one, is when you are saving something in TextEdit, and you dont pay attention to where you save it, it ends up in your Cloud and not on the desktop, and you have to hop into your plane and go and haul it out of the Cloud and pop it back onto the desktop, where you are working on your stuff. Another annoying feature I'd love a fix for. When I enter an event in Calendar, with a title, location, start and stop times, a note (or just some of these), almost all the time, when I click in the date box to close the event dialog box, the item reverts to "New Event", with everything I entered vanished. Occasionally, I do something to close the dialog box which retains the data, but I don't know what. Can you tell us how to always keep the entered data? Very odd - I would think that just closing the New Event window would work, and it seems to for me. However, I almost never use Calendar since I far prefer BusyCal. Fantastical is also good. Perhaps take a look at one of those? YES!!! Great tip. The 'Duplicate' process slows down my work flow. Great to have "Save As..' back again. In the shortcuts pane there is a checkbox in front of all other shortcuts, but such a box does not appear in front of the new shortcut, so I can't enable it. There's no checkbox in mine either, as you can see in the screenshot above. I think the checkbox appears only for default shortcuts that Apple provides. As to why it's not working... what version of OS X are you using? Do I need to restart? Or perhaps log in as admin when making the shortcut?? Restarting isn't necessary - it works immediately. But I don't know how not being logged in as admin will affect things - I always run as admin. Worth trying, anyway! Fascinating. Apart from a restart, I can't think of anything else that could be related. Perhaps try setting some other keyboard shortcuts and make sure they work too? Got it. Changed the shortcut for "duplicate" which was using the shift-cmd-s shortcut and - lo and behold: not only did the new shortcut for "duplicate" appear but now also the "save as" that I had already made. Yes, great, BUT once I restored "Save as" according to your instructions I lost the CMD-S shortcut for saving pages (at least in Safari, where I save pdfs all the time using CMD-S). Now I have to use CMD-SHIFT-S which is a little counter-intuitive. Try redefining the keyboard shortcut for Save As to Command-S in just Safari - you can do that in the Keyboard > Shortcuts pane too. You have to have a document with unsaved changes in it before choosing Save As to get that checkbox. If there are no unsaved changes, it won't appear. Thanks extremely for Saving Save As ... -- TidBits is invaluable. Now if there were only some way to revert some of the other "improvements" that I assume came with the Modern Document Model (I jumped from Snow Leopard to Mavericks and have been struggling ever since). What's bizarre and inexcusable to me are the changes in dragging documents to folders. Sometimes dragging MOVES the document (using Cmd-drag), sometimes it copies the file, and worst of all, sometimes it creates an alias - so I think I've got a copy in the folder -- BUT NO -- it's only an alias, and too bad if I happened to delete the original! I can't tell how to predict what will happen -- it's just trial and error. Hmm, I wonder what could be causing the behavior you're seeing. In general, dragging works as you expect it to, with drags between folders on the same volume resulting in a move, and a drag between folders on different volumes resulting in a copy. Force a copy instead of a move by holding down Option. Force a move instead of a copy by holding down Command. Make an alias by holding down Command and Option. There are now (not sure when this happened) a few "special" folders, like Applications. You can drag an app into Applications, but if you drag it out to another folder, OS X tries to give you an alias by default. However, dragging it to the Trash works as you'd expect, as does Command-Delete to delete it. I could imagine a scenario where some of your folders had ended up with permissions that make OS X think of them like the Applications folder. You might check the permissions on any folders that act strangely in the Get Info window. A blast from the past! Outstanding, Adam! I love having "Save As" back and "Duplicate" gone. Wow! At 71 I'm only a toddler in the Tidbits world, or at least no more than a teenager. Keep up this sort of thing and you'll have fanatical supporters. So pleased to have a simple recipe to return my Mac to "sensible" behaviour! Reminds me of some of the tweaks I used to do before OS X, like renaming the Trash to Bin for UK users. Which reminds me, why doesn't the trash name change to Eject when the icon changes? (Maybe this is fixed in El Capitan - I'm still on Mavericks.) Anyway, many thanks. OK, this is embarrassing. I just realized that if you redefine the keyboard shortcut for Duplicate, so that it's hidden unless you press the Option key, that will also redefine the keyboard shortcut for Duplicate in the Finder, which is a completely different command (and one I want attached to Command-D). The fix is to assign Command-Shift-Option-S to Duplicate for All Applications, and then create another shortcut for just the Finder that assigns Command-D to Duplicate. THANK YOU!!!!! I absolutely hated the "duplicate" feature and have messed up many a document with it. I was thrilled to see Adobe CS6 and Excel 2010 still used Save As. I just followed your steps and it's now back to Save As in Preview and the other programs. My Keep Original box was NOT checked and I had never touched it before. I'm on Yosemite. I miss "Save As" command very much, I hope you bring it back. Adam, thanks again (as always) for what TidBITS offers the community. I had no idea that my brief comment would lead to a great article that would satisfy many folks on a small annoying piece of "Apple OS progress." I hadn't seen anything about the "Modern Document Model" cross my radar. I'll try to shovel more comments to the TidBITS crowd about such "little" things when I can, as this is indeed a core reason why I have supported the TidBITS gang for so long -- sharing shortcuts and learning lessons in a forum not connected to a corporate culture goal is very valuable to navigating the waters of an ever-changing toolset. I hope others will also ask and answer to keep the richness of this on-line forum (and the TC documents!) front and center. YES PLEASE. KEEP THOSE TidBITS COMING! Very helpful. I'm one of those who hates the Duplicate command, especially when I want to keep the original, not make the changes in that as well. As a side note: any idea why Apple is sticking to OS 10.x? Lion was enough of a change that it should have become OS 11. If not Lion, the when the cats were left behind, with OS 10.9. Will we ever see OSD 11, or some years from now, will we be up to OS 10.647? There are rumors that Apple will change the name to macOS at WWDC - we'll see what that does the version numbering.